When you work with me, you will receive dedicated attention from a lawyer who has the best interests of you and your family at heart. Ms. Cleous has 30 years of legal experience, enabling her to handle the demands of your case regardless of the complexity. Working closely with you to fully understand your situation, I will address your questions and concerns and provide the solid legal advice you need to make the best informed decision about the matters that affect your case. From this commitment to my clients' needs and goals, my law firm has earned a reputation as one of the top family law practices in the region. 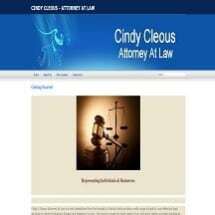 To find out more about how Cindy L. Cleous, LLC, can best help you and your family with your legal issues, you can contact my law office to schedule a free initial consultation.